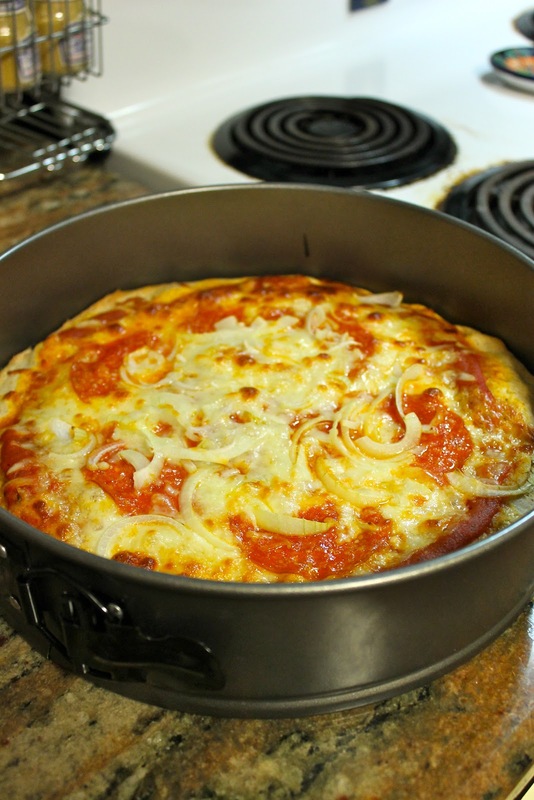 Bossy Italian Wife : Pizza...In A Springform Pan! I make a lot of pizza because pizza is awesome. I know that many of you out there will agree with me on this, so I don't need to elaborate on the awesomeness of pizza. Now, I have a pizza stone, and I truly love it....but when it comes to forming pizza, well, my shaping skills are alright. They aren't great. Once upon a time when I was surfing the internet I saw someone make a pizza in a springform pan. I filed this deep within the recesses of my brain and for New Year's when I made some pizza dough, it was as though my brain was like, "HEY! Remember that set of springform pans you have?!?! Put some pizza in it!" And so I did. The other night, when had a full day of cooking ahead of me, I wanted to make another pizza and share it with all of you. There are many benefits to making pizza in a springform pan, and I feel they shouldn't be overlooked, so we're gonna take a moment to appreciate said points together, in list form. 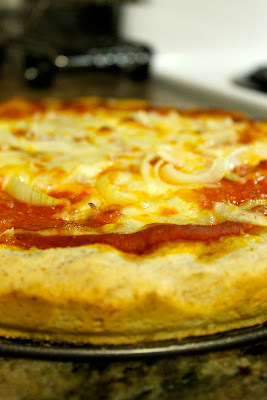 2) It makes a super round shaped pizza. Which is awesome. Unless you are into squares or something. 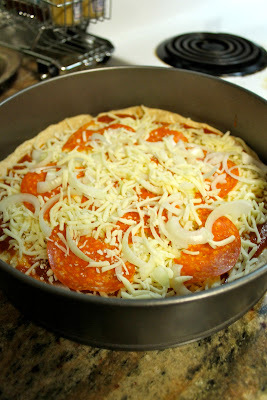 3) If you are looking to make a deep dish pizza, this is the ticket. The. Ticket. 4) I love the way the pizza cooks in my springform pan. It gets crispy and softy in all the right ways. 5) I just felt like I needed a fifth point in my corner, but really, I don't have a fifth point--go with it. Or add your own in your head...it doesn't even have to be about pizza! So I had my pizza dough in the freezer (I made a double batch and froze some) but you can use store bought, freshly made--or whatever dough works best for you. It's great that stores carry fresh dough now because it simplifies homemade pizza for a lot of people. So don't feel bad buying dough if you are busy or whatever. 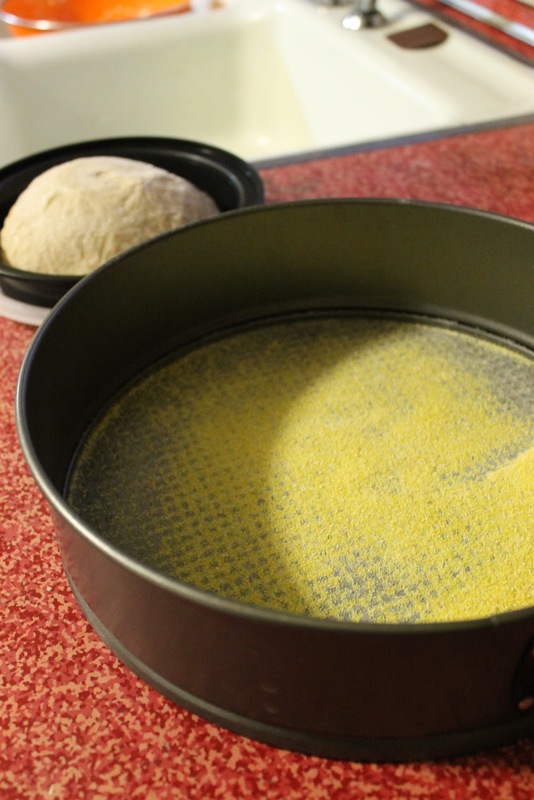 Also, dust your springform pan with cornmeal. It keeps the pizza dough for sticking. Now take your dough and finagle it into your pan. I like to use my hands, but you don't have to worry if you prefer to roll it out. Whatever works. Also, let's talk about pan size. This is the largest in the three set, and the smallest is the nine inch. It totally doesn't matter which pan you use, it is entirely dependent on how deep you want your dish. And also how large you want your pizza. Put some sauce on that dough! Doesn't matter if you make your own or buy it....I have to admit, I bought my sauce this time because I found it for 99 cents. When I bought it, I told my sister-in-law "don't tell anyone." But then I thought, "That's silly!" So I am telling everyone. Here's an awkward picture of me putting cheese on my pizza. True story: I had a totally better picture but I deleted it. Please, enjoy this awkward position. And remember: no one should have to break their arm in the name of pizza, but I love you guys, and my blog, so whatever works. I used the deli sliced pepperoni, which I tore in half with my hands. Technical, I know. Then I also added some onion and, can you believe it, MORE CHEESE! Then I popped this sucker in the oven, which we need to talk about. I take preheating an oven for a pizza very seriously. I like to preheat the oven to 450 degrees for at least 30 minutes before I put my pizza in. It ensures that this sucker is getting into a fully heated oven and it will be HOT HOT HOT! Talk about a pizza! YUM YUM! My husband and I devoured this pizza ourselves. No shame. It was awesome. I recommend preheating your oven to 450 degrees and letting it preheat for about an half an hour. In case, preheat your oven to 450. Sprinkle cornmeal in a light dusting over your springform pan. It prevents the dough from sticking. 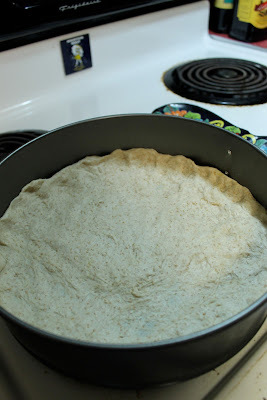 Spread the dough to fit your springform pan. I like to use my hands to stretch the dough, but you can also use a rolling pin. No judgements. 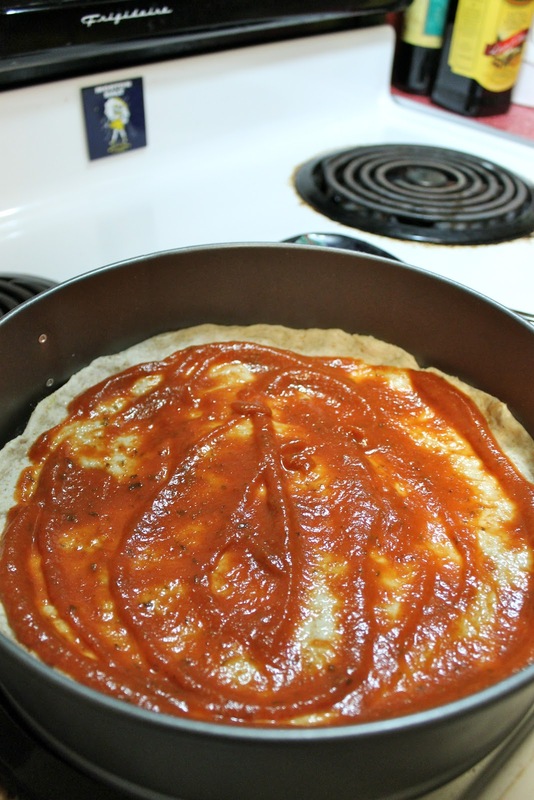 Spread your sauce over your dough. 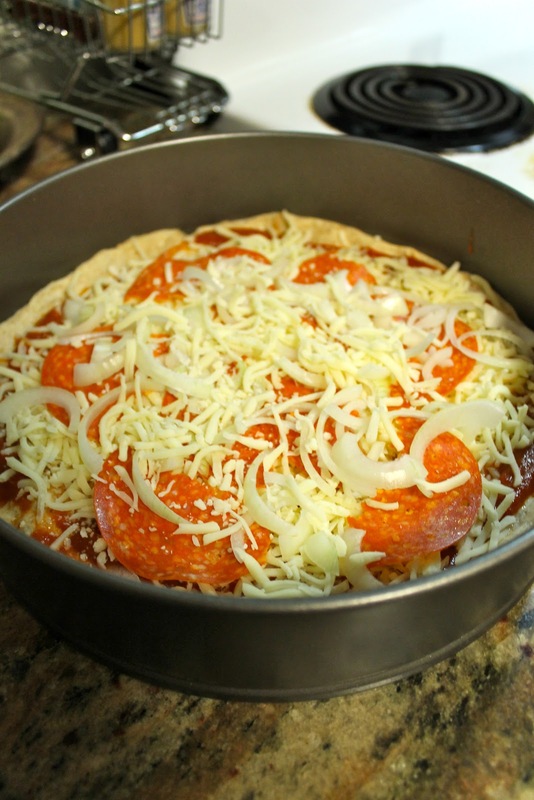 Add cheese, distributing evenly, and reserving a handful for after your put on the toppings. Add your toppings. I like to do my pepperoni first and then my onions, but hey, whatever works. Add your last handful of cheese over your toppings. Place your [awesome] pizza in the oven and bake for 15-18 minutes or until it's reached optimal doneness. I know I like mine a little bit crispy. Let it cool a hot moment and then slice into pieces!!!! you might try putting some olive oil in the bottom of the pan. the crust sort of fries. It's great. You don't need to pre cook the crust at all? Loved your article. 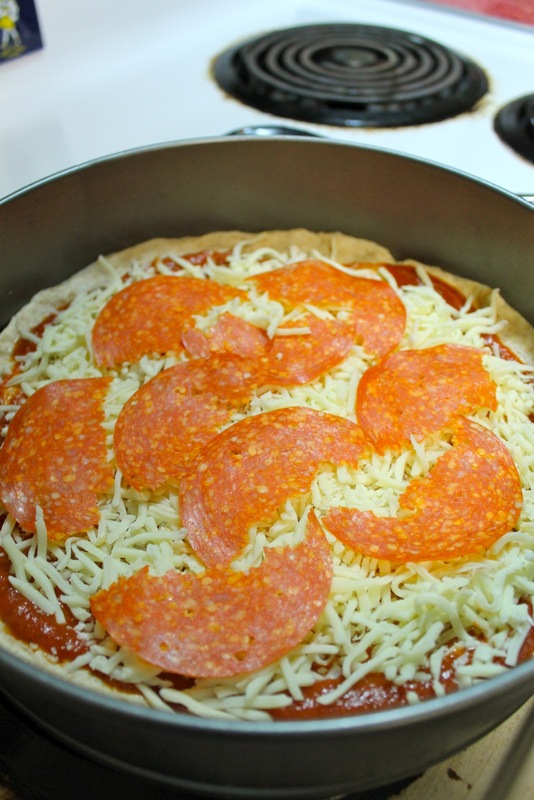 Here’s a fifth benefit of using sprinform pan: toppings can be piled to the edges without them falling off. So those who don’t like crust, rejoice!